Mana is a tiny 1.2 kilometer long island within Fiji’s Mamanuca archipelago, with three beautiful beaches, tropical gardens and a beautiful lagoon in the middle. All the beaches on Mana Island boast turquoise waters with great visibility, which is why snorkeling off the beach is a must-do activity. The islands' shape makes it perfect for water activities right off the beach. For the quietest beach, head to North Beach. North Beach on Mana Island offers travelers a stunning view over a couple of uninhabited islets and heading around to Sunset Beach will allow you to do some more water sports and enjoy one of the most beautiful sunsets in Fiji. Mana Island will make you feel like you are truly in the middle of Fiji’s beautiful tropical islands and you should not leave before taking a snorkel/dive trip around the island or a short hike up to the viewpoint. Set sail from Denarau Port towards the ever-beautiful Mana Island and get glimpses of the magnificent Mamanuca Islands along the way. You will cruise through Mana's turquoise lagoon before stepping ashore at this tropical paradise. Mana Island is the perfect place to relax and unwind, boasting three separate beach areas, lots of palm trees, complimentary cabanas and umbrellas, a beach bar, 2 outdoor swimming pools with poolside bar. There’s also 3 restaurants, tennis court, kids club and full-service spa. A day trip to Mana Island is truly a blissful experience, one not to be missed if visiting Fiji! If you are thinking about visiting Mana Island for few hours or a full day, you can simply book a tour with South Sea Cruises. The island is very close to Denarau making the travel time to Mana island short and pleasant, allowing you to focus on maximising time spent swimming and soaking up the sun. The tour includes a delicious bbq lunch and you will have the opportunity to spend around 6 - 9 hours strolling around on the beaches or doing watersports out front in the lagoon (depending on if you take the full-day or half-day tour). While on this trip you will be provided with snorkel gear for free and given the opportunity to do other activities for an extra fee such as fishing, water-skiing, parasailing or jet skiing. On most of the beaches you will find palm trees providing shade and a few bars and lounge areas, often part of the resorts on the island. There are three resorts on Mana Island; Tadrai Island Resort, Ratu Kini Dive Resort and Mana Island Resort & Spa. If you are looking for a cheaper place to stay on Mana Island you can have a look at Ratu Kini Backpackers and Dive Resort or the Mana Lagoon Backpackers. Diving around Mana Island can be done from Nadi, Denarau and from the island itself. 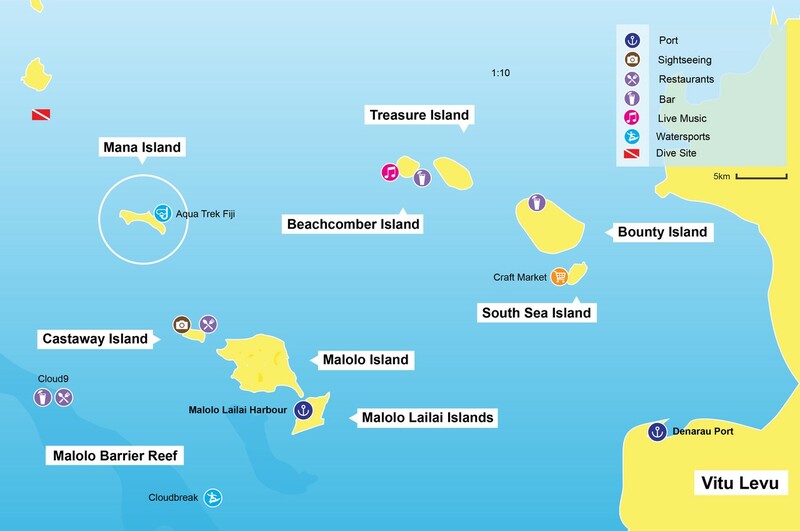 With around 44 dive sites around Mana there is enough to see for both the inexperienced and advanced diver. There are two dive operators on the island, Aquatrek Mana and Ratu Kini Divers of which the latter is the cheaper option. They offer single tank dives, tank packages and even night dives for the more adventurous divers. The marine life around Mana Island is breathtaking with beautiful soft corals, schools of fish, manta rays, different types of shark, shrimp and clams all over. If you'd like to depart from Denarau/Nadi to dive around Mana Island you can book your trip through us now with Aqua Trek Fiji. If you are thinking about going to Mana Island there are several ways to get there. There are daily departures from Denarau Marina going to Mana Island throughout the day. You can choose to book a one way ticket or return from your location to Mana Island or you can look for the Mana Island tour (full and half day) in the activities offered on our website to book your day trip to Mana Island.